Wintergreen essential oil extracted from the leaves of Wintergreen plants, botanically known as Gaultheria Procumbens is native to North America and Canada. Gaultheria fragrantissima wallich is indigenous to India and the Indian Wintergreen essential oil has similar therapeutic properties just as the American Wintergreen essential oil. I love Wintergreen oil for its effectiveness in relieving muscular pains and spasms. Experts call it as ‘Nature’s Aspirin’ as it is exceptionally potent in treating arthritic and rheumatic pain since ages together. Ayurveda, the ancient natural science of healing calls this herb as Gandapura and was used in many spiritual ceremonies where this sacred plant was trusted to bring harmony between earth and its inhabitants through its healing powers. The essential oil of Wintergreen was used for flavoring in the primordial times. The principal constituent of this oil is methyl salicyclate, which is 98% of this oil and other major constituents are gaultherilene, myrcene, limonene and formaldehyde. The Native Americans used Wintergreen leaves to brew tea for treating rheumatic problems and chewed the leaves to treat respiratory problems, headache, sore throat, fever, tooth decay and to augment lung capacity. Wintergreen essential oil is used externally as a folk medicine for joint problems, muscular discomforts, inflammation, cramps, rheumatism, arthritis, psoriasis, bruises, eczema, improper blood circulation, cellulite, headache, obesity and certain heart diseases. Wintergreen was used in numerous ritual practices for treating curses, protecting from evils and for its amazing healing benefits. According to the Gas chromatography report, Wintergreen oil constitutes of 2 chemical components that contribute to its fragrance, therapeutic attributes, consistency and quality of this oil. Of which, Methyl salicylate contributes to the highest proportion of Wintergreen oil with about 99.9% of its total composition. I trust that this must certainly help you in getting to know the exclusive information about the prime chemical constituents of Wintergreen oil. The table crafted below clearly depicts the unique nature and contributions of these bio-chemical constituents to the healing magnificence of Wintergreen essential oil. Ayurveda is a holistic approach that doesn’t focus on the disease alone but treats the individual as a whole. According to this ancient science, human body is made up of three doshas or energy elements namely vata, pitta and kapha, which are a combination of five vital elements of nature (air, water, fire, earth and ether). Vata symbolizes air and is responsible for ejections, eliminations and discharges of the body. It regulates metabolism and is the key to functions of the brain and nervous system. Pitta represents fire and is in charge of digestion, body temperature, vision and reasoning skills. Kapha with its lubricating qualities signifies earth and is completely responsible for the shape and figure of an individual. Reproductive health, circulation, muscular strength and ability to regain good health are vested with a balanced kapha. Every individual will have a predominance of any of these three doshas where the predominant one determines the characteristic of an individual. Good health is a symbol that your doshas are in balance and imbalance of any of these doshas will end up in illness. Ayurvedic remedies are purely natural and suggest the use of herbs, essential oils extracted from plants, Abhyanga or Ayurvedic massage, practice of yoga, meditation, taking up an Ayurvedic routine and spirituality. Wintergreen essential oil is a trusted medication in treating vata imbalances predominantly. In Ayurveda, wintergreen oil is used in treating Vata gout where the autoimmune system gets weakened and affects joints and muscles. This is mainly due to the natural pain killing attribute of Wintergreen oil and a gentle massage with Wintergreen essential oil is said to soothe and warm up the skin, granting complete relief from pain, stiffness, inflammation and dryness. Rheumatoid arthritis or chronic rheumatism is a long term health disorder and is known as Ama vata in Ayurvedic terms. It affects the joints, causing inflammation, swelling, redness, and sharp pain. Ayurveda states that the fundamental cause for this illness is the imbalance of the digestive fire and the stagnation of ama or toxic substances of the body mainly due to unhealthy lifestyle and stress. Wintergreen essential oil has stimulant, anti-arthritic and anti-rheumatic properties that aids in discharging toxins from the body through urine and stimulating proper blood circulation. Wintergreen essential oil is used as a counterirritant in treating pain, sores, muscular pains, lower back pain, achy joints and inflammation, where counterirritants act by creating an irritable sensation that lessens swelling and pain in the tissues. The analgesic, relaxant and anodyne properties of this oil cause numbness and warmth when applied on the painful area. It eliminates pain, reduce stress, drive away tension and induce good sleep by inhibiting the formation of prostaglandins responsible for causing pain. This is mainly due to the presence of Methyl salicyclate which is equivalent to the conventional medicine aspirin (the fundamental component of aspirin is salicyclate). These soothing and pain-relieving attributes of Methyl salicyclate in Wintergreen essential oil makes it a vital part in celebrated pain relievers like BENGAY. The anti-spasmodic properties of Wintergreen oil aids in treating all kinds of spasms in the respiratory system, digestive system, nervous system, circulatory system and muscles. Nervous afflictions, muscular contractions and certain other health disorders due to spasms can be effectively treated with the oil of Wintergreen. Wintergreen essential oil is highly toxic and it acts as a protective shield against bacteria, virus, fungi, microbes and other harmful organisms. This makes it a good antiseptic and protects the skin from being septic in case of microbes’ prone open wounds, cuts and other skin infections. This oil is very powerful and kills Staphylococcus Aureus bacteria and heals septic problems. Mild application on the skin is effective for treating all types of skin disorders as this oil has the potential to infiltrate into the skin and is easily absorbed by tissues and blood stream for faster relief. Wintergreen essential oil is also effectual in uplifting the skin, augmenting the skin tone and fighting against the symptoms of aging. To put in simple terms, this oil boosts digestion, promotes quicker absorption of nutrients and stimulates trouble-free excretion, where the toxic substances of the body are eliminated for supporting good health. The hepatostimulant property of Wintergreen essential oil assists the secretion of digestive enzymes, bile, gastric juices and hormones facilitating proper functioning of the body. This oil stimulates the working of gall bladder, liver, kidneys, endocrinal glands, digestive system, excretory system, circulatory system and the nervous system. The diuretic attribute of Wintergreen oil aids in eliminating the excess water, salt, fat and uric acid in the body through urine, which makes it a promising natural remedy for treating bladder infections, hypertension, edema, obesity and water logging. Being a natural emmenagogue, wintergreen essential oil helps in treating plenty of womanly problems like delayed menstruation, uterine ulcers, dysmennorhea, blocked menses, pain in the pelvic region, hair fall, hemorrhages, fatigue, vomiting and stress related to menstruation. A soothing massage using 2 to 3 drops of Wintergreen essential oil blended with sesame oil can grant complete relief. Adding few drops of this oil to your bath tub with warm water can calm your nerves and soothe your senses. The strong aroma of Wintergreen essential oil improves attentiveness and stimulates the mind. Applying this oil to your skin is said to heighten the vibration of the body and accentuate sound. Increased vibration helps in unveiling spiritual awareness and paves way to the harmony of self and divinity. This attribute has made Wintergreen oil to be an incredible part of the ancient chants (mantras) and meditations where sound was used for adding spiritual strength. Wintergreen essential oil improves logical thinking and stimulates mental power. Apart from all these natural benefits, this oil is used as a flavoring agent in candies, root beer, chewing gums, smokeless tobacco, mouth fresheners, mouthwash like Listerine, in toothpastes and certain other oral care products. It is also used as a solvent in printmaking. Ingesting Wintergreen essential oil should be strictly avoided as it is highly toxic and can cause serious health effects. 1 fl oz of this oil is equivalent to 171 adult aspirin tablets. Use it only as a topical application after diluting it with soothing carrier oils in 1:10 ratio. This oil has blood-thinning effects and should be avoided by people who are susceptible to aspirin. Never use it on children below 12 years of age, pets, pregnant women and on broken skin. Consult your healthcare practitioner before using Wintergreen essential oil for your individual constitution. The MSDS (Material Safety Data Sheet) of Wintergreen oil is readily available for your enhanced safety and better usage. 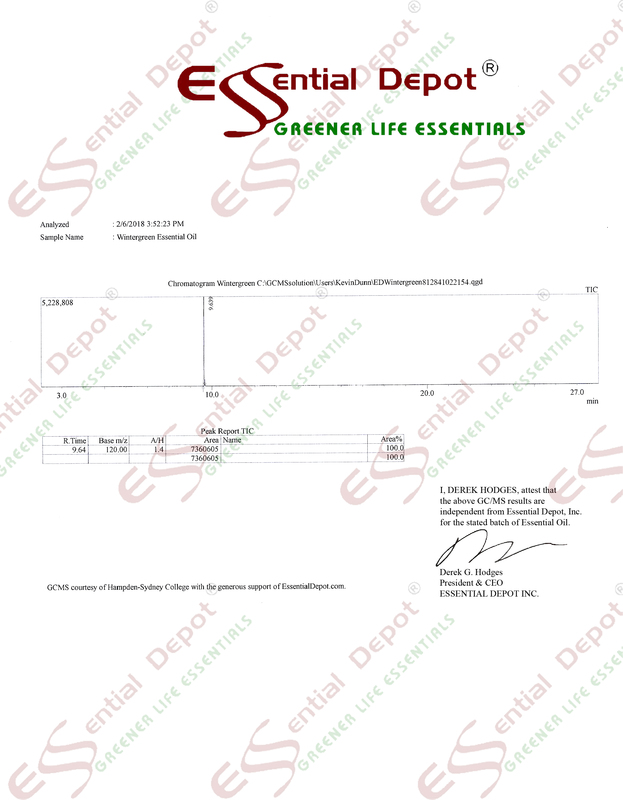 Gas Chromatography Report (GC analysis) of Wintergreen oil. Wintergreen oil can also be called as methyl salicylate as this essential oil contains about 99.9% of the methyl salicylate component. Besides being an excellent analgesic equivalent to the aspirin, it leaves behind trepidation with numerous adverse effects on the human system. Alarmed as a toxic substance, Methyl salicylate is claimed as a neurotoxic, teratogenic and unsafe during pregnancy, labor and nursing. Poisoning due to Methyl salicylate is said to cause adverse dermal conditions, vomiting, sweating, respiratory alkalosis, pulmonary and laryngeal edema, fluid retention, lethargy, tinnitus, internal haemorrhage, restrains blood clotting and should not be used when using blood-thinning drugs. “Methyl salicylate is much more toxic than salicylates” quotes the book, Leung’s Encyclopedia of Common Natural Ingredients used in Food, Drugs and Cosmetics. Various studies also witness that lethal poisoning of methyl salicylate in Wintergreen oil can happen by absorption through the skin cells. Mainly due to the aspirin-like qualities of Methyl salicylate, there are chances for bleeding and other subsequent side effects when applied on the skin for treating pain and spasms. The safe maximum dermal use level of Wintergreen oil is 2.4% as per the International Fragrance Association (IFRA). According to the Health Canada Cosmetic Ingredient Hotlist, March 2011, the safe maximum level of external use of methyl salicylate in topical products is 1%. This level of usage is applicable only for topically used products and is invalid for rinse-off products, including soaps, shampoos and other bathing products. A 2007 study, published in the Cal Journal of Emergency Medicine reveals that percutaneous (effected through the skin surface) absorption of Methyl salicylate in Wintergreen oil and other salicylates, may end up in acute poisoning, especially in people with renal failure. This study also concluded that based upon the autopsy, the death of an elderly man with renal failure occurred due to the continuous dermal absorption of Wintergreen oil. Skrakosch studies on ointments containing salicylic acid, state that the factors affecting the dermal absorption of salicylate are “the effect of salicylic acid on the epidermis, the pathologic state of the skin, the degree of hydration of the stratum corneum, and the solvents used.” Based upon the studies on volunteers with normal skin, it was found that salicylate ointments caused damage to the epidermis within 2 to 14 days. The use of methyl salicylate is prone to interact with drugs when used along with anticoagulant medication (warfarin) and GERD (Gastroesophageal reflux disease). It is good to avoid Wintergreen oil if you are sensitive to salicylates and certain other skin conditions as it may trigger skin damage. Methyl salicylate is also said to inhibit platelet aggregation. Along with Methyl salicylate and aspirin, all kinds of salicylates are teratogenic in nature and might harm the fetus so it is best avoided during pregnancy, labor and while nursing. The reproductive toxicity of Methyl salicylate has been witnessed as reproductively toxic in rodents and it can also be 4.5 times more poisonous in humans than in rodents. Various studies have proved the high mortality rate of methyl salicylate accounting to 50 to 60% with 4 to 8 ml used in children is reported as the lethal dose for children. Use of Methyl salicylate on children (including infants and toddlers) should be strictly avoided, (especially in children with ADHD-Attention Deficit Hyperactivity Disorder), patients with hypersensitivity, asthma, gastro-intestinal irritation, inflammation and salicylate allergy. Studies have proved the neurotoxic effects of Methyl salicylate, the excess of which can end up in death via respiratory collapse and cardiopulmonary arrest. Based on the analysis of deadly salicylate poisoning cases, it was detected in post-mortem examination that about 18% had abnormalities in the nervous system. Wintergreen essential oil used in a diluted form, blended with safe carrier oils like coconut oil is safe only for external use. 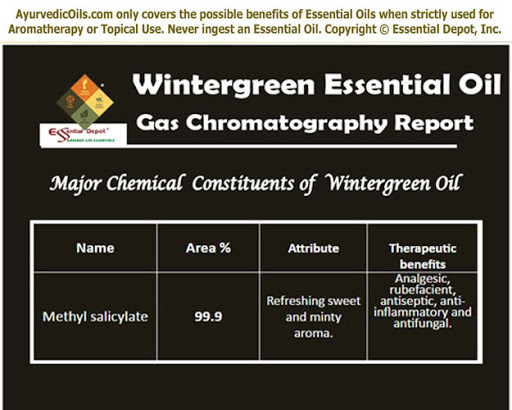 Never ingest Wintergreen oil as Methyl salicylate is highly fatal and may cause severe toxicity. The most prevalent symptoms of Methyl salicylate poisoning are fever, excitation of central nervous system, high blood pressure, confusion, rapid breathing, convulsions and even coma. 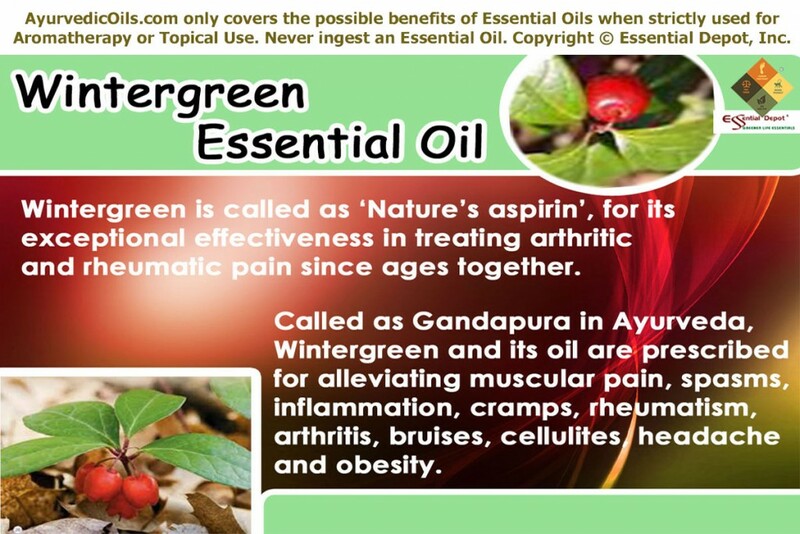 This entry was posted in Essential Oils - Learn About and Purchase and tagged adverse effects of Wintergreen oil, Ayurvedic health benefits of Wintergreen essential oil, ayurvedic oils for digestion, Ayurvedic oils for pain, Essential oils for respiratory problems, essential oils for rheumatoid arthritis, essential oils for women, Gas Chromatography report of Wintergreen oil, Gaultheria fragrantissima wallich, Gaultheria Procumbens, Greener life Diamond Bio-Healthy Score of Wintergreen oil, health benefits of Wintergreen essential oil, Methyl Salicyclate, MSDS report of Wintergreen oil, Oils for rheumatism, oils for skin care, possible skin issues of Wintergreen oil, Safety data sheet of Wintergreen oil, Therapeutic properties of Wintergreen oil, Wintergreen oil, Wintergreen oil and Ayurveda by AyurvedicOils. Bookmark the permalink.